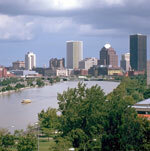 2 April 2008: The US city of Rochester, New York State, and its immediate suburbs occupy about 160,000 hectares, or the same land area as London, England. The difference is that Rochester’s urbanized core contains 735,000 residents versus 7.6 million in London. London, for its part, has less than two-thirds the population density of Tokyo. Over the past 20 years, urban planners, geographers, and environmentalists, especially those in the US, have pointed out the problems associated with sprawl development -- from traffic congestion to a spatial mismatch between where people live and where jobs are located to the high fiscal costs of an ever-expanding infrastructure. Solutions focus in the internal urban environment, that is, on ways to create healthy, pedestrian-friendly cities with ample open space and human-scale design. A new body of research is emerging that considers not only an “inside” look at urban growth, but also its external impact on the global environment. 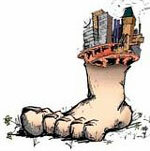 Urban Ecological Footprint. Canadian ecologist William Rees developed the concept of an “ecological footprint” to refer to the environmental impact of modern cities and industrial areas. The ecological footprint of a city is the surface area required to supply a city with food and other resources and to absorb its wastes. The ecological footprint of a city no longer coincides with its geographic footprint. “Twentieth century cities are dependent for survival and growth on a vast and increasingly global hinterland of ecologically productive landscapes,” explains Rees. Life in a modern city may require wheat from Russia or soy from Paraguay or American steel reprocessed in India. “Cities necessarily appropriate the ecological output and life support functions of distant regions all over the world through commercial trade,” according to Rees. Calculating a city’s ecological footprint provides a rough measure of its natural resource requirements compared to available supply. Using Ree’s formulation, the ecological footprint of London is approximately 19.7 million hectares, or about 125 times its geographic area. Rees estimates that the ecological footprint per capita is three hectares in Europe and four to five hectares in North America -- but, worldwide, only one-and-a-half hectares of productive land are available per person. According to Rees, no European or American country  except for Canada, with its vast size and resources and relatively small population  could sustain itself at current consumption standards if forced by changing circumstances to live on domestic resources. Yet, this is the model that the world now follows. Space satellites have tracked the increased illumination from expanding cities around the globe, as well as the deforestation of Amazonia. As rapid industrial growth and increasing living standards continue in developing nations, third world cities are creating their own ecological footprints. Certainly, comparing population to available resources is not a new idea. Thomas Malthus in the 1700s predicted that population growth would rapidly outstrip food supplies leading to catastrophe. And several bestselling books during the first “green” era of the 1960s and 70s ominously pointed out the limits to growth. At the other end of the intellectual spectrum, researchers note that societies have never collapsed due to population growth but in fact increased their carrying capacity through birth control, high-yield agriculture, alternative energy, and other technologies. What is not debatable is that more people now live in bigger cities. In 1950, there were 83 cities with populations exceeding 1 million. Today, there are nearly 500. Within ten years, 90 percent of Americans and 80 percent of Chinese will live in cities, joining their counterparts in Europe as the world’s most urban societies. Clearly, the key to a sustainable world is urban sustainability. The greening of cities is not an easy task, especially if the goal is to reduce the ecological footprint. Public health, public safety, market economics, politics, and many other complicated issues must be taken into account. US cities are a case in point. Growing grain for biofuels to power US cities may lead to rising food prices in Latin American or Asian cities. Computers from American cities can be recycled, but not always profitably. Hazardous components are often shipped to the third world where they may poison indigent salvagers and pollute the environment. The use of eco-friendly products like bamboo in American buildings may cause shifts in cultivation patterns in other countries with adverse effects on local food production. The United States has been a laggard in sustainability, supplying five per cent of the world’s population but consuming as much as 25 per cent of the world’s energy. In the absence of any serious efforts by the Bush administration to address environmental challenges, state and local leaders like Governor Arnold Schwarzenegger of California and Mayor Greg Nichols of Seattle are at the forefront of public-sector efforts in the US to reduce carbon emissions. Popular attitudes in the US appear to support broader and deeper sustainable practices. A 2008 Zogby International poll, commissioned by the US Conference of Mayors, found that 56 percent of Americans believe that government should “go green” and make environmentally-friendly and energy-efficient changes, even if it requires significant changes in Americans’ lifestyles. The findings are significant because, over time, politics generally follows public opinion in the United States. Given the reach of the US economy and its influence on global production and consumption patterns, a reduction in the US ecological footprint would make urban sustainability much easier to attain throughout the world. Sweden has a penchant for safety and cleanliness. Swedes invented the Volvo, one of the safest automobiles. Volvos are built to minimize harm to passengers during accidents, and they are built without toxic flame-retardants. Swedes invented the safety- match and dynamite too - much safer than the alternative it replaced, black powder. Recently, Sweden has become known for its innovations in sustainable development - safer development. Sweden recently declared that it will create an energy and transportation economy that runs free of oil by the year 2020. But the groundwork for this radical declaration was laid in the 1980s by Sweden's eco-municipality movement, which successfully incorporated sustainability into municipal planning and development. Before former Norwegian Prime Minister Gro Harlem Brundtland became a household name in international environmental circles, Sweden and Finland were stimulating local economic growth in ways that were good for people and the planet. The town of Overtornea - Sweden's first eco-municipality, on the Swedish-Finnish border - was an early adopter of what we now call sustainable development, which "meets the needs of the present without compromising the ability of future generations to meet their own needs." [The Brundtland Report, 1987].